Well, this is it! The X Factor’s Two-Night Finale on Wednesday and Thursday on Fox beginning at 8:00 P.M.
And, while the curtain has not even come down on Season 2, LA Reid has already confirmed that he would not be back as judge for Season 3. Well, I could see that coming. I am sure you could as well. I can’t imagine Fifth Harmony will win but, then again, I thought Simon’s protégés, Emblem 3, would move on to the Finale. However, what I am really needing tonight from The X Factor is another tribute to the victims of Sandy Hook Elementary School. I am still in a state of utter shock here. My heart aches for these families. For the community. Enjoy the show and add your comments when you can. Hmmm! LA really didn’t like getting the “over’s” group, huh? Simon’s part of that tribute was very touching! I’m not sure who the drum line were…but I would have liked a close up of them!!! Good show tonight. Fifth Harmony is over-produced but it was pretty creative I thought. Great night! Yes, Simon spoke about the Sandy Hook Tragedy, very emotional. The only thing negative that I am going to say is…back sometime ago I asked about Carly’s voice since she is so young will she mature out of it…LeAnne Rhimes answered that question for me! The fans of these three have their work cut out for them tonight!!! I thought this really was a great show!!! Vonnie – I will have to find this message from Simon. Carly has had extensive vocal training. Plus enormous broadway experience as well. I don’t think she will ever lose her vocal talent because her technique is flawless and deeply ingrained. The tribute was well planned and very touching. I appreciate them doing it too. Vonnie, I think the Voice had about a six stop tour the first season but I don’t know about last year. I hadn’t really thought about Blake’s stock going up as the coach to have, but that was very perceptive of you. I also hadn’t heard of LA’s plans to leave that MCL reported. He may be headed to Nashville. I felt sorry for Leann Rimes tonight and it made me wonder if they were sending the subliminal message that Vonnie alluded to. I think Carly realized her distress and was actually carrying her at the end of the song. She’s a little pro. Who would have thought that one more singing competition singer could get by with doing “Hallelujah?” Under the circumstances and from her lovely voice, not only did she pull it off, but it was very welcome. Tate was pretty solid tonight but, even though the ladies might like the underlying message of “Motor Boating,” I didn’t think the vocal fit his voice or the ladies hanging on him fit his style. His Reprise of “Anything Goes” was very good. They are really pushing the girls and it occurred to me that each of them probably brought a small fan base with them into the group, plus the ones they have gained since becoming a group. Demi was lip syncing during her performance with them and during their better performances this year they appear to be as well. I have the feeling that Simon is pitting the girls against Carly so Tate wins. Tate may give him the quickest return on his investment and he still holds the option on the contracts for the others. The poor pitiful Paul story line they have hung on Tate is unbecoming but I believe he has done what he needs to do for the win. I sat stumped as to why this show would have LeAnne Rhimes a country crossover, who’s voice left her in her teens come sing with Carly…of all the people they could have brought to sing with her, heck Britt coulda got up there! Subliminal message? I think you may be on to something there! When LeAnne sang “Blue” she was stellar, being compared to Pasty Cline and promised longevity in the music business….and if I am not mistaken she was about Carly’s age when she was taking the world by storm. I really got the impression last night that win, place or show, Tate Stevens has already arrived…I think between LA and Simon, he’s gonna make music. I too thought there were alot of lip synching going on during Fifth Harmonies songs, all of them!!! Subliminal message? Hmm not too sure about that. My first thought was they wanted to stimulate the country fan vote for Carly. And Demi singing with Fifth Harmony – if you can call it singing. Lip synching is more like it. Couldn’t find anybody else to sing with these girls? Honestly, the way Carly was treated during the commentary was awfully cold and distant. It was like pulling teeth trying to get a compliment out of those judges, especially Simon. She is a bona fide star and he should be shouting to the rooftops that he snagged this little bundle of talent. MCL…I have been reading some reviews from LeAnn and Carly’s song together, it seems that LeAnn likes to nip a little…well, er, Alot!!!!! Carly did look very confused a couple of times, and I did notice at one point LeAnn searching for the right words…Carly handled it all very well. 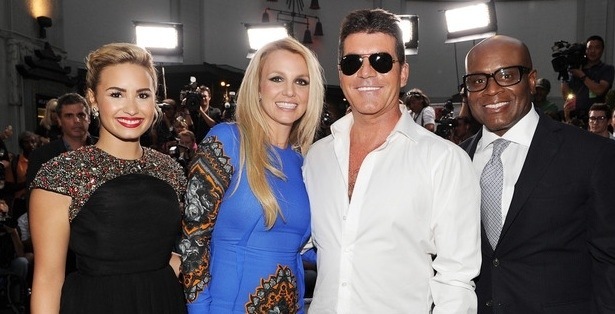 Shame on XFactor for even thinking of this pairing…Now! Had they brought on Michael Buble or Tony Bennet, that would have been awesome! Yeah! I don’t think they are too worried about country votes for her, they are all pretty wrapped up! I don’t think this show knows what to do with Carly…Country votes are wrapped up in Tate…Teen and tween pop votes are wrapped up in Fifth Harmony…this leaves poor Carly with LeAnn Rimes. I could see Carly doing glee…her voice totally fits that show! I love glee and Nashville, and her background in theatre would work great for this kind of career. I agree that Carly is a mega talent, but honestly as much as I’m not a country fan, I’d still like to see Tate Stevens win. He is super talented too and I really wish him the best–win or lose! Hi Louise!!!!! I love Tate too…he and scotty have me wanting to listen to country music…at least theirs anyways!! I’ve missed seeing you here and it was a nice surprise to see your post this morning. Okay! I’m sticking with Tate for the win…I think it will be Tate, Carly and Fifth Harmony!!! Two of the very best contestants…May God Bless them both! Wishing each one of you a very merry Christmas and a Blessed New Year!!! Congratulations, Tate!!! Also best wishes to Carly who surely has a very bright future ahead of her. If it had not been for these two performers, I would have totally given up on watching X-factor this year. I actually didn’t watch it all the time, but when I did, I never lost my love for Tate. He’s a down-to-earth guy whose talent and life story made me love him! Thanks for the kind words Gene and Vonnie! I’ve missed all of you at Masterclasslady.com, but life has been a little busy over the past six months. A grown daughter moved home after a break-up, and my other daughter and her husband blessed me with a new granddaughter two weeks ago!!! She’s 40 and I was afraid that she might never have children so it’s been a very happy time! That show was all filler. What. A. Mess. Seriously. Simon cannot find anyone to perform on this show. Anyway congrats to Tate and, of course, we know Carly is going to have a great career. Merry Christmas and a Happy Blessed New Year to you too Vonnie. And to all! We really couldn’t lose with these two. Congratulations to Tate. I don’t think I recall anyone getting through their coronation song as well as he did tonight. Carly is such a nice kid as well a very special singer. I hope she finds someone to mentor her in the way that she and her special talent deserve and I can’t wait to see her on top. I know she was very disappointed under the big girl exterior. I can’t believe this show is coming back again next year. Congratulations on your new granddaughter Louise!!! There is a reason they call them grand you know. I just wish that I had my grandkids before I had my daughters. Not really, but… On the positive side the baby may have a better chance to bond with her aunt since she has come back home. The same thing happened in my family and the Lord blessed us with our second son in law and our third grandchild. Don’t be a stranger. Merry Christmas to each and every one of you and many blessings for the New Year. Thank you very much, Gene! She is a real sweetie! My son also has a 17-year-old son who doesn’t live near me, so it’s been a long time coming for another grandchild. Unfortunately, they also don’t live near me, but are hoping to move closer in another year. Good to hear that good things happened to your family! There’s nothing more important in family. I wish good health and peace to all of you in the coming year! I hope everyone had a lovely Christmas/Holiday. I was still wrapping presents on Christmas Eve. It is good to hear news of new babies in the family! My four Grandchildren added much to our celebration of the birth of Jesus. May all the Grandparents get by with a bit of spoiling. :o) Congratulations, Louise! The X-Factor was not a high priority so I was late in viewing it. Simon needs to find a better way to present his talent. I agree LeAnn was disappointing. Seems many of you got your wish for the winner. The show did have some good talent, but they don’t support them after the show ends. Peace, love, and good health in the coming year to all of you! Thank you Rosanne for hosting this blog. God bless you! Now counting the days until AMERICAN IDOL starts! Yes KariAnn – BRING ON AMERICAN IDOL !